8 pages. Volume 4, Number 12, dated June 30, 1978. Newsletter / bulletin originally mailed-out to amusement game operators, providing updated info about the coin-op industry. A great historic insight to the industry of the time. 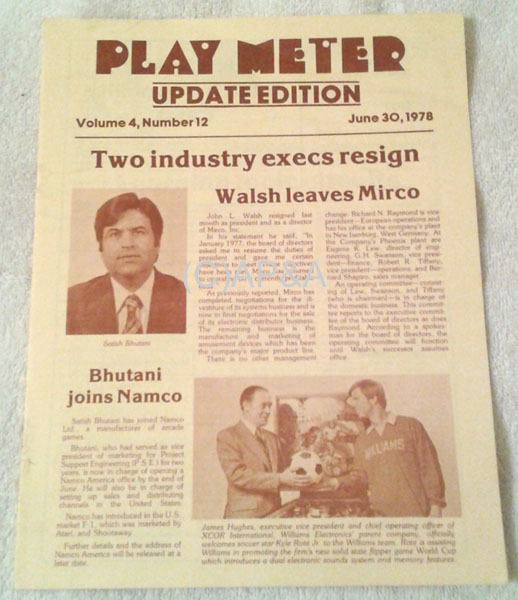 This edition includes information about Williams promoting World Cup pinball with soccer star Kyle Rote, Jr., interchangeability of other manufacturer's flipper coils for use in Atari pinballs, logic circuit tech info, juke box updates, tech info and tips, classified ads, and for juke box operators- a listing of the top 100 record/singles- pop, soul, and country for the time ("Shadow Dancing" by Andy Gibb being listed as the 3rd week at the top position). Original newsletter in excellent condition. Small minor ballpoint pen mark on back side. Operator's address label present on back.